Today I attended the ISTE International Committee meeting in the Oak Room of the Omni Hotel. Led by Camilla Gagliola the committee comprises non-US and US representatives and aims to increase the internationalism of ISTE. I was invited to be part of this group 2 years ago, and despite a 2-year turnover regulation that seems to be vaguely not enforced, I am here again this year. Today we discussed ways to increase international membership (currently standing at about 700 out of the 16,000 total ISTE members) by possibly offering different types of membership (such as free, online, group, library etc). We also discussed the possibility of creating ambassador positions within ISTE whereby representatives of ISTE attend conferences and government-initiated events globally with the view to promoting and sharing knowledge about ISTE. The membership Committee joined us for a working lunch and we continued to discuss options and how best to support the integration of technology around the world. Some excellent ideas were minuted. 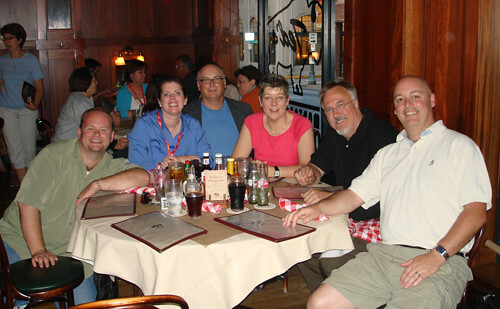 I am hoping ISTE Board will show some insight and move towards implementing some new ideas....small steps at first. This afternoon Vicki and I attended the ISTE Member Welcome and Conference Overview to accept our award. We are absolutely thrilled to be receiving this award from SIGTel (Special Interest Group Telelearning). It is the Online Learning Award for 2007 and has been awarded to us for our work on the Flat Classroom Project. 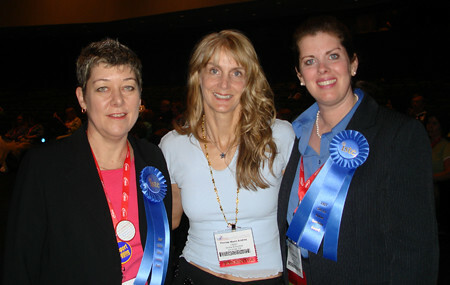 The award was presented to us by Trina Davis, President of ISTE. It is a marble plaque, beautifully done and quite heavy (thinking of international travel...it's OK I will make room!). Congratulations goes to the other award winners this afternoon including Carole Colburn and Charlene Chasis. For those at NECC who want to learn more about our Flat Classroom Project and about the more recent Horizon Project please come to the Poster session we are presenting on Tuesday at 1-3pm in the Galleria. We would both love to show you our work and talk, especially to prospective Flat Classroom teachers for next year! The first keynote for NECC07 was given by Andrew Zolli. Andrew was upbeat and shared an interesting perspective about where the world is going and why we need to be more aware of trends as educators.....you know my 6pm jet lag was kicking in so I am not going to make any astute comments about this session except that I really enjoyed the drumming group beforehand. OK, off to the aquarium....along with thousands of others. We found the queue (British term meaning line) too long and found our way to Ted's for dinner instead. Delightfully we gravitated towards other like-minded attendees including David, Jeff, Mario and Chris. I don't think as a group we have solved all of the worlds problems yet....we need a few more bison enriched dinners to do that... but a great time was had by all! Julie and Vicki congrats on your awards. The conference is jammed packed with great opportunities and people as well. One thing about techie people we always have a backup plan. We missed the aquarium too, but had a great dinner at Pitty Pat's Porch. Enjoy your day.